Today VirSyn released ReSlice, which is their take on the performance sampler, a la Samplr. 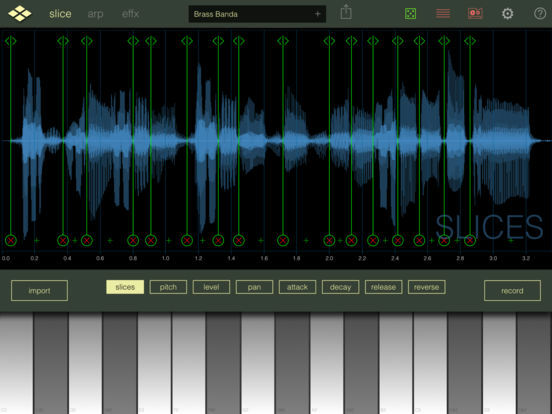 There are quite a lot of advanced features to be found in the app; including a polyrhythmic arpeggiator, 7 built-in effects, AUv3, Audiobus/Inter-app Audio, and support for AudioShare! ReSlice even arrives on sale! VirSyn has released a demo of the app that starts off silly, but is quite thorough with captions explaining it all. Wow, VirSyn have been busy beavers lately, that's awesome to see! I don't really use things like this (or I haven't as yet) but I'm guessing this is like 'Sector' with its stochastic beat mangling? It seems really interesting anyway and it's great to see them continually adding to their already excellent portfolio! spent an hour playing with this today on the bus... great app. The slicing facilities are nothing new to anyone with Gadget or Egoist, but the combination with the polyrhythmic arpeggiator makes this awesome! I was just playing with Samplr the other day getting some cool texture stuff out of it, but this looks kinda cool.